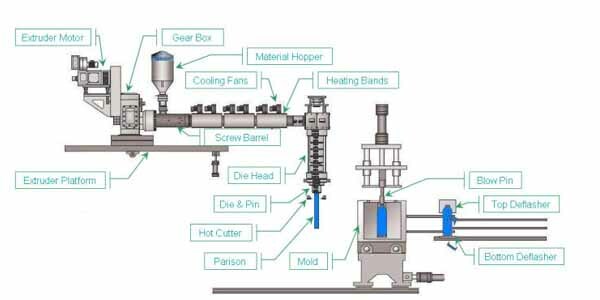 PROCESSES | PLASTICS 101 | B&C PLASTICS LTD.
Resin pellets are heated by friction into a molten state inside of the barrel. It is then pushed (extruded) by the screw through a die and mandrel to create a parison which resembles a hollow tube. 2. 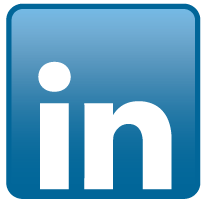 Blowing: The parison is extends to a predetermined length. The blow molds, composed of two halves, close around the parison, pinching and sealing the bottom closed. Blow pins are then inserted into the top of the tube, forming the neck finish. Compressed dry air is then blown into the parison which expands the parison to conform against the cold mold cavity walls thus forming the container. Molds have water cooling to keep their surface cold. 3. 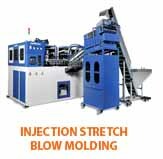 Trimming & Eject: When sufficiently cool, the mold opens and the container is removed and trimmed of excess plastic or flash. 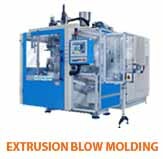 Flash, a basic characteristic of extrusion blow molding, is formed when the parison is pinched off by the mold. Since plastic resins can be reprocessed, the flash is not wasted but is used as regrind mixed back with virgin material. 4. Control: Wall distribution, thickness and weight can be controlled by parison programming. While the parison is extruded, programming changes in the relation of mandrel and die can be used to shift material from heavier, stronger areas to lighter, weaker areas. 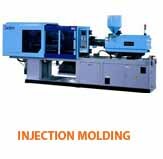 This method aids significantly in maximizing container performance and minimizing container weight and cost..
Low initial mold tooling costs. Short Lead Times. Flexibility of tooling. Molds can accommodate interchangeable neck finishes and body sections. Flexibility in production: Neck inner diameters (I.D.) can be easily controlled to varying requirements. Bottle weights are adjustable. 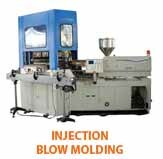 Wide selection of machine sizes: Molds can be geared to volume requirements up to 15MM annual. Top Machine Manufacturers: Bekum, Automa, Fischer, Milicron.